Does anyone remember the night Obama got elected? In most places, a turbulent economy and a desire for change shifted the vote firmly into Obama's corner. In a nation in which african Americans were once bought and sold, an African American was elected President. A change in public attitude towards race made Obama's election possible. Additionally, laws were passed that protected the rights of all citizens to vote, as well as protecting voters from intimidation. In Philadelphia on Election Day of 2008, a blind eye was turned to voter intimidation. The Justice Department has refused to get involved. The news media is largely silent. Why is this so? 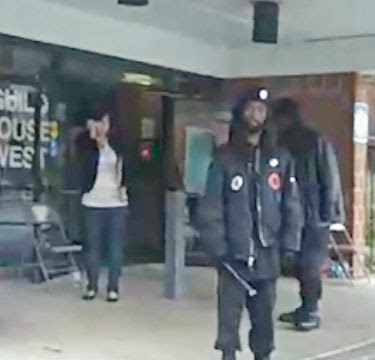 On Election Day in Philadelphia, it was Black Panther Party members in military style uniforms, brandishing billy clubs who were intimidating white voters, blocking the entrance to the polls . A Republican Party poll watcher (see video below) was told not to bother getting involved, that a black man was going to be President anyhow. He was told this by an election official. This happened over a year ago? Why is this "old news" being brought up? The Justice Department continues in its refusal to investigate voter intimidation. A Justice Department inspector who wants to investigate the complaints has informed a Republican lawmaker that his authority to investigate the reports of voter intimidation have been stripped away by Congress. The Washington Times reports as follows. "In a terse letter to a Republican lawmaker who requested an investigation of the dismissal of complaints against the New Black Panther Party, Justice Department Inspector General Glenn A. Fine said he should be able to do so, but was powerless because Congress had stripped him of that authority. In a four-page response to Rep. Frank R. Wolf of Virginia, who had requested that the IG's office investigate what he called the complaint's "unfounded dismissal," Mr. Fine said that unlike all other inspectors general who have unlimited jurisdiction to investigate all claims of wrongdoing inside their agencies, his office does not." Why is the chilling case of voter intimidation in Philadelphia not being investigated? A civil rights law should be enforced equally on behalf of all citizens. If this is not done, then civil rights law are not civil rights laws at all. Unfortunately, this is not a new problem. When Yankel Rosenbaum was lynched in Crown Heights in 1991 by a mob screaming "Kill the Jew!" , the Justice Department under Janet Reno was totally disinterested in pursuing an investigation. It took lobbying and protesting to prod the Justice Department into action. That is probably what will be required here. Eric Holder is blind to any injustice that does not precisely resemble his preconceived notion of what injustice is. According to his myopic view, the Democrats are the champions of the working class and citizens of colour. Accordingly, any malfeasance on behalf of a Democratic candidate just isn't that important. African Americans racists in mean looking costumes are useful idiots to the Democrats in Washington who are in power. They are probably getting chump change for the useful services they have rendered for their Democratic beneficiaries. We need a Justice Department that defends the rights of all citizens of any race. We clearly do not have that now. This must change. Norman Rosenbaum did not back down. He demanded justice for his slain brother Yankel. Those who want civil rights laws enforced in Philadelphia should take a page from Norman Rosenbaum and not back down or be silent. This case would not in any event have changed the outcome of the 2008 Presidential elections. It is about the right of every citizen to vote without fear and have that vote properly counted. It is about justice, pure and simple.